The Beth Baby Boot in Oracle is perfect for those who are looking for a skinny with a little bit of boot. 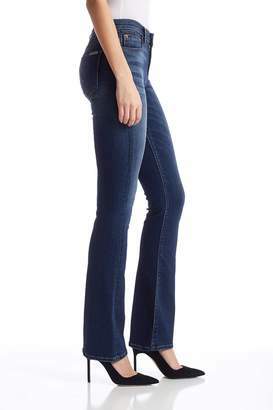 The midrise fit hugs the bum and thighs and subtly flares into a slight bootcut to give you a long, lean silhouette. Contour waistband that sits higher in the back for more coverage. Great for for straight or curvy body types. A deep cobalt, super soft fabric due to the viscose rich yarns, enhanced by the modal fiber. In addition to these yarns, it has a special finish to increase the soft hand. It is a super stretch with excellent recovery. Front rise: 8.5"; Inseam: 34.5”; Leg Opening: 16”. Model wearing size 26. 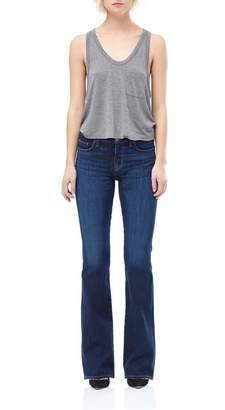 Model stats: Height 5'10", Waist 26", Hips 34", Inseam 33".